My littlest one turned 9 last week. Every year I say it, and I'll say it again, where on earth does the time go? This year's party was a garden/pool/disco for 14 girls. I know, what was I thinking... practically teenagers, they are. Crikey, I'm not sure I'm ready for this! But this cake was reasonably easy. 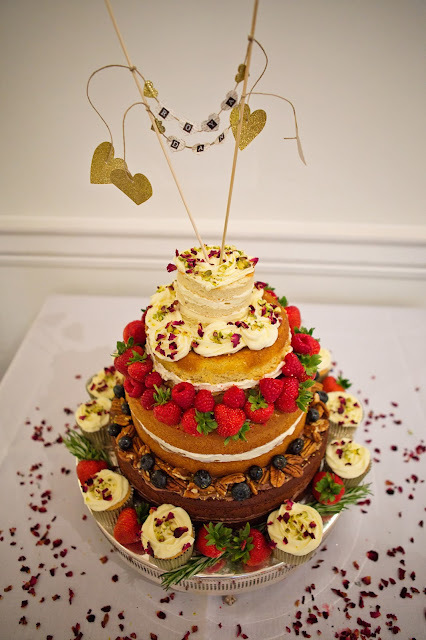 I made a 9" Victoria sponge, filled with vanilla buttercream. No strawberry jam, as strawberries tend to flare up my daughter's eczema. This layer was covered in raspberry pink fondant (which you would think would have a similar effect, but not so far). 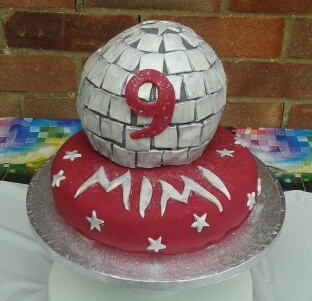 The disco ball I made by making a giant cupcake Victoria sponge, slicing and carving into a vague spherical shape, and then covering initially in silver fondant. Then I cut out millions of squares of white fondant, and stuck them on, starting with the middle line, and working my way around. On top I put a star shape to fit the last bit. 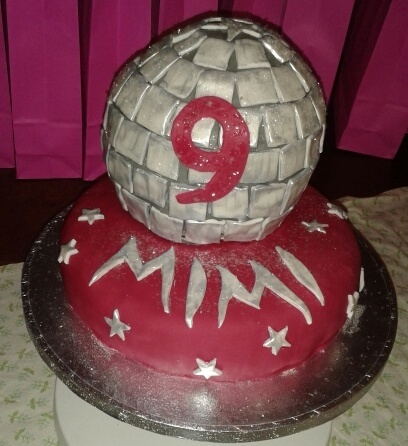 Then I painted all this with silver colouring (similar to my Porsche cake) and sprinkled over plenty of edible glitter. The 9, the little stars and the lettering were hand cut and painted similarly.